These activities focus on the artistic production process. Pupils will discuss works of art In the exhibition rooms, then in the workshop, they will explore different materials and reflect on what they have created. Check out the various options and book the one best suited to your needs. Monday to Thursday: 10.00am, 11.30am, 1.00pm, 3.00pm. Fridays until 1.00pm. The workshop-visits last an hour and a half and cost 3 € per child (5 € in English, French, German and Bilingual). Teachers are free of charge. Workshop visit for Infant Second and Third Levels and Primary First Level. There are some complex faces to be seen in the pictures hanging in the museum exhibition rooms, depicted from several angles at the same time. After looking at and talking about some of them, the pupils will go to the workshop, where they will use scissors, adhesive paper and pastels to work on the idea of the portrait. Workshop visit for Primary Second and Third Levels. We shall explore the idea of volume, perspective and 3D. Working with different types of paper, we will explore these ideas by making folded paper sculptures of different-shaped figures. The artworks we shall look at range from the Cubist drawings, to Picasso’s late sculptures in cut metal. Workshop visit Secondary and Bachillerato Levels. In this workshop, pupils will be making cyanotypes. Working on Cubist images, they will focus on ideas such as superimposed planes, perspectives, etc. Using translucid images on acetate and opaque images on paper, they will create compositions that, when placed on photosensitive paper and exposed to sunlight, will be reproduced almost like photographs. Workshop visit for second and third year of Infant level and first stage of Primary level. This activity is all about dance and the depiction of movement, as seen in the paintings, drawings and photographs in the exhibition. Pupils will use paper, scissors, string and pastels to create mobile designs. Workshop visit for second and third stages of Primary level. A tour of the exhibition will help the children to discover the art of drawing. In the workshop, they will learn the keys to drawing lines, form, perspective etc., then they will draw figures themselves. Workshop visit for Secondary and Bachillerato level. In the workshop, they will use burins, acetate sheets, inks, paper and a printing press to make their own prints. This activity focuses on the artistic production process. In the exhibition rooms, pupils will debate about the artworks. In the workshop, they will explore different materials and then discuss what they have made. The tour is given in Spanish and is free for schools in the official Andalusian compulsory educational system. Discounts are available for all other schools. Monday to Friday at 10.00am 11.00am, 12.00am and 1.00pm. Tours last one hour and are adapted to different school levels. As from second stage of Primary level. 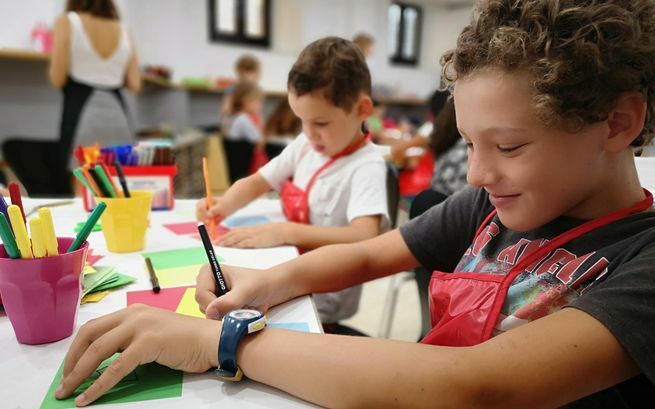 In a participatory visit to the rooms that house the permanent collection, pupils will be able to look at and discuss Picasso’s work, the history of art and any other issues connected with their own interests. A member of the educational staff will provide the link between the artworks and the participants, grouping together pupils’ different opinions and thoughts. A look at the museum’s permanent collection to discover Picasso’s works and talk about issues relating to modern art. We are offering students a participatory tour of the exhibition on Olga Khokhlova, Picasso’s first wife. The show looks at the years they shared together, putting into perspective the creation of some of Picasso’s greatest works and reconstruing this output in the context of a personal story that developed alongside another political and social one. For second and third stage of Primary, and Secondary and Bachillerato levels. A conversation about art in the museum can be a unique chance to practice the foreign language pupils are studying at school, be it English, French, German, Dutch or Italian. This activity costs 75€. Monday to Friday at 10.00am 11.00am, 12.00am and 1.00pm. We are offering teachers a look at the life and story of Pablo Picasso’s first wife, in the exhibition Olga Khokhlova. It covers the years they shared together, putting in to perspective the creation of some of Picasso’s greatest works and reconstruing this output in the context of a personal story that developed alongside another political and social one. Available for teachers from schools belonging to the Andalusian official compulsory education system. From Monday to Thursday from 5.00pm to 6.00pm and from 6.00pm to 7.00pm. Minimum of 10 and maximum of 25 teachers each hour.